We are excited to announce that the Midwest Machinery LTD , sole agent of Happy Japan, will show the first Happy embroidery machine equipped with GMI thermal cutting device (TCD) at the Printwear & Promotion LIVE! Show. This is the official launch of the GMI Easy Cut system in the UK, after its first and successfull presentation in Italy in October 2017. Stop by the booth of our reseller Midwest Machinery LTD, stand F70 in hall 18, to see our TCD system cutting embroidered applique, embroidered patches, embroidered letters and so on. The device has been designed for any brand of embroidery machine and it easily adds on value to them, because it is an easy way to kiss-cut and die cut embroidered appliques on garments or fabric accessories. Printwear & Promotion LIVE! 2018 will take place in Halls 17 & 18 at the NEC, Birmingham from Sunday 21 – Tuesday 23 January, 2018. The exhibition offers visitors the opportunity to see new products and solutions within the garment and promotional product decoration industry up close and in action. Visitors can register for fast-track entry to Printwear & Promotion LIVE! 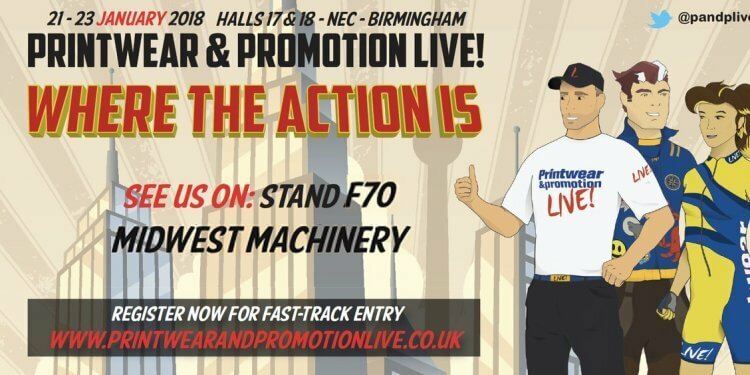 2018 by visiting www.printwearandpromotionlive.co.uk and clicking on the registration button.